This delicious dish combines all of the favorite anti-inflammatory superfoods into one hearty bowl! The Anti-inflammatory Salmon Bowl starts with a base of protein-packed quinoa, which is topped with spinach, salmon and blueberries, along with a simple drizzle of olive oil and a squeeze of fresh lemon. You can also save time by doubling the recipe and enjoying leftovers for lunch. Add quinoa to a medium pot. Add water and bring to a boil. Reduce heat to low, cover, and cook for 15 minutes or until quinoa is tender and water has evaporated. Remove lid and fluff with a fork. While quinoa is cooking, add coconut oil to a medium skillet over medium heat. Season the salmon with salt and pepper and add to the skillet. Cook the salmon for about five minutes, then flip. Continue cooking for another five minutes or until the internal temperature reaches 135 degrees F. Set aside. 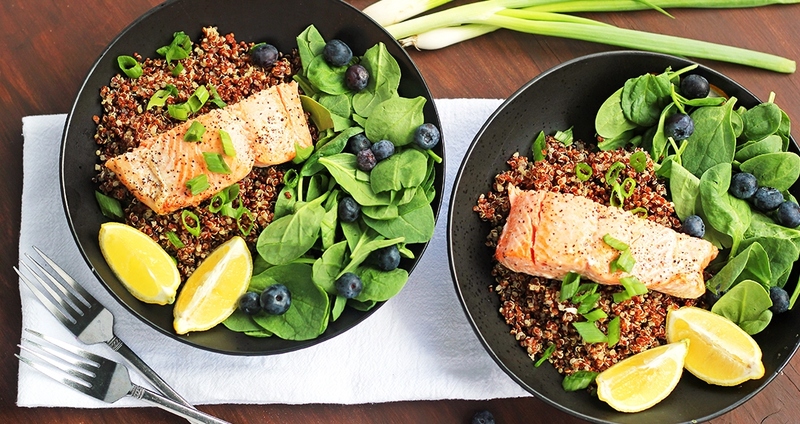 Divide the quinoa between two bowls and top with spinach, cooked salmon, scallions and blueberries. Drizzle with olive oil and serve with lemon wedges. Season with sea salt and black pepper to taste.